I’m going to try making another version of Chili Sauce. This recipe was contributed by Mrs. Howie of Waterloo in The New Galt Cook Book (1898). Since I’ll soon be over run with Chili Sauce if I make the full recipe for the many sauces, chutneys and pickles in this cook book, I’m going to cut Mrs. Howie’s recipe in half. 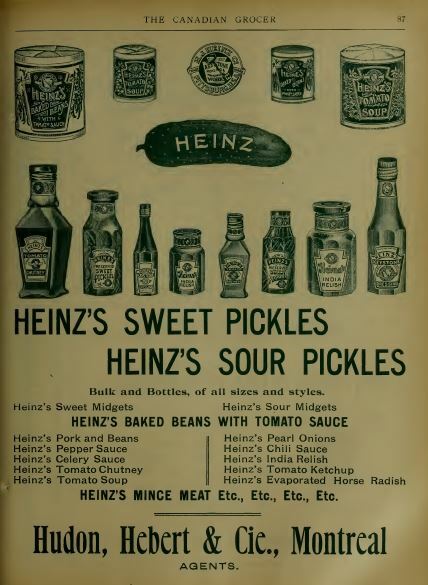 Varieties of red pepper seeds available in 1898 in the Peter Henderson catalogue. I chopped 3 nice ripe tomatoes, 3 cooking onions and 1 sweet red pepper. I wondered what sort of red pepper Mrs. Howie used but I decided to try it with a regular sweet red pepper. We’ll see how it turns out. Since this only cooks for an hour I cut the vegetables (fruit) into very small pieces. I put them into a saucepan and added 1/2 tablespoon salt and 1/2 tablespoon sugar. I covered the pot and left it to boil for an hour. I checked it every so often to give it a stir. After the hour was up I added 1/2 cup of white vinegar and let it boil for 15 minutes. I removed a portion to cool so I could taste it. The rest will get canned. Mrs. Howie of Waterloo is Mary Ann Gardham. She was born to John and Mary in Kingston in 1838. The marriage of Alexander Howie and Mary Ann Gardham took place sometime between 1861 and 1871. They had several children and spent many years living in Waterloo. Mary Ann died in 1923. I think Mrs. Howie’s Chili Sauce is great. This is not a sweet chili sauce. Instead it is slightly tangy with vinegar but I liked it. It is reasonably quick to make although you need to do a bit of chopping. I suppose a modern cook could find a way to make the prep work of chopping the vegetables a little easier but I don’t mind it. I think the sweet red pepper was the right choice at least for my taste. Maybe you could use a hotter pepper if you like that sort of thing. Do keep an eye as it cooks. It looks like a lot of liquid at first but I nearly burned it as it cooked away even with the lid on. This version of chili sauce contains a large proportion of onions so if you’re not fond of them skip this recipe. I loved the amount of onions since I prefer them to tomatoes or peppers. This recipe is a keeper for me. Yesterday I bought a basket of tomatoes. I wasn’t sure which of the many tomato recipes in The New Galt Cook Book (1898) I was going to try with them but tonight I decided to make Mrs. Marshall‘s recipe for Chili Sauce. There are several other chili sauce recipes but this one has just onions and tomatoes plus an interesting array of spices. One peck of tomatoes is 1/4 of a bushel or 8 quarts (32 cups) of tomatoes. I had a one quart basket so I’m cutting the recipe to one eighths and that means 1/2 cup of onions, 1/8 cup of sugar, 1/8 cup of vinegar, 1/8 oz of whole cloves, 1/4 tablespoon of cinnamon, 1/8 tablespoon mustard, 1/16 teaspoon cayenne pepper, some salt, and a bit of black pepper. I chopped the tomatoes roughly and peeled the onions and chopped them a bit more. I decided the onions should be chopped rather fine since this sauce only cooks for one hour rather than several hours like some sauces. I wasn’t sure whether to bag the cloves but decided to leave them loose in the sauce. I’ll skim them out later. I assumed that dry mustard powder was the intended type of mustard. Once everything was cooking in the pot, I covered it and left it to simmer for an hour. I stirred every so often and the smell was nice. The tomatoes cooked down but were still a little chunky after one hour. Mrs. Marshall is probably Mary B. Gordon wife of Anthony Marshall since they are the only couple with that surname in Galt for the 1891 census. Mary’s parents Frank and Jessie were living in Georgetown Ontario when she was born. Mary’s father was from Scotland but her mother was from Puslinch township. Sometime after Mary’s birth her family moved to Milton. She married Anthony in 1890 in Puslinch. He had been married previously to Elizabeth Clouse. They’d had two children but one died of jaundice when he was sixteen days old. Mary and Anthony had five children. Sometime between 1901 and 1907 the family moved to Calgary Alberta. They were all together then but things seem to change afterwards. Their eldest daughter works as a stenographer and they have four lodgers living with them at 627, 5th Ave W in Calgary. It’s an area of Calgary that is full of high rise businesses today. Then in the 1916 Alberta special census Anthony shows up with several of the children in Bow River Alberta but Mary isn’t there. I can’t find her death record so I don’t know if she’d died by this point. Their last child Mildred was born in 1911 when Mary was about 46. This sauce is okay but is surprisingly bland. I thought it would have more flavour. It is a nice tomato sauce rather than a chili sauce athough I think itwould have been better if I’d cooked it without the lid. It might have been thicker and less watery. This might be a good beginner chili sauce but I’ll have to try some of the other sauces in the cook book to see if it is typical of 1898. One peck ripe tomatoes, one quart of onions, one cupful sugar, one cupful vinegar, one ounce of whole cloves, two tablespoonfuls ground cinnamon, one tablespoonful mustard, half a teaspoonful of cayenne pepper, three tablespoonfuls salt; black pepper to suit the taste. Boil one hour. Excellent with beef.